As a collections intern at the Mount Holyoke College Art Museum, I have worked on a variety of projects over the past year and half, ranging from making housings for Roman pottery fragments to reorganizing Chinese snuff bottles. The project that has been the most engaging is the one I have pursued this semester. 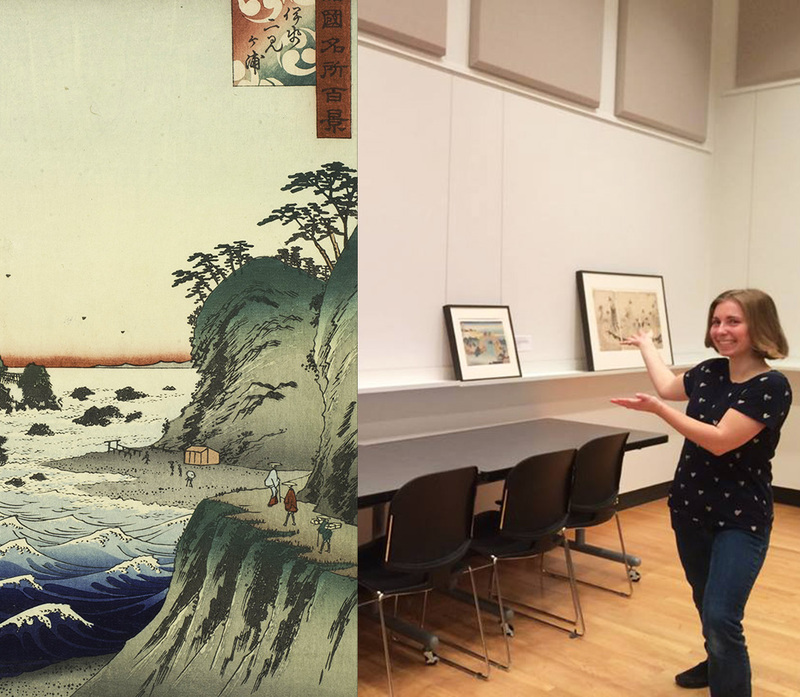 At the suggestion of Collections Manager Linda Best and Museum Preparator Jacqueline Finnegan, I began the re-organization and re-housing of the Museum’s ukiyo-e print collection. Ukiyo-e woodblock prints emerged as a genre of art around the 17th century and were meant to capture the popular entertainments and fleeting pleasures of life for the non-aristocratic classes of Japanese society. While the objects were safe and in good condition, the organizational structure of the collection needed to be improved to allow for easier access. To accomplish this goal, I organized the prints in their new storage units by artist last name and by the size of the print itself. This new system will allow those looking for a specific print to locate it more accurately because they can now use logical criteria such as the artist’s name. In addition to needing a new organizational structure, some of the prints also needed their housings updated so they would fit in new storage configurations planned for spring 2016. As I began working on the project it became clear that it held great academic potential, so I approached the Mount Holyoke Art History Department about an independent study on the collection, which they approved. Working with my academic advisor, Professor Ajay Sinha, I conducted my research by delving into the Museum’s object files and by reading a variety of texts from authors such as Anne Nishimura Morse, Richard Lane, and Julia M. White. Emily Ewen '16 and Museum Preparator Jacqueline Finnegan with 24 empty solander boxes, which previously housed Japanese prints. The online exhibition of the Mount Holyoke Ukiyo-e Print Collection is my cumulative project for my independent study, and presents a deep exploration into the many prints that I have been handling over that past few months. What immediately struck me about the collection was not only its vast size--at upwards 550 prints--but its breadth in subject matter, individual artists, and creation date. Although it’s impossible to encompass everything the collection has to offer in one exhibition, it is my hope that the prints that are illustrated on the website will inspire others to start their own research on the topic and inquire about the prints that could not be shown. To achieve this goal, the prints in this exhibition have been chosen to illuminate the vast variety of techniques and subject matters that are significant to ukiyo-e, and which are represented in the MHCAM collection. Many of the prints are attributed to master printmakers such as Suzuki Harunobu, Utagawa Hiroshige, and Katsushika Hokusai, all of whom have had a lasting impact on the genre.